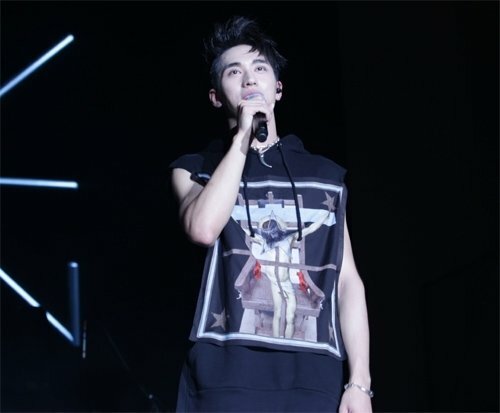 Chinese star Xu Weizhou visits Seoul for concert. June. 28, 2016 07:27. by 이새샘기자 iamsam@donga.com. In less than six months, an ordinary college student has become a social media star in boasting of 2.4 million followers. This is Xu Weizhou who has emerged as the hottest star in Asia after Chinese web drama "Addicted" was launched in January this year. A story of teenage homosexuality, the drama instantly became popular as more than 10 million hits were recorded in just a day since its release. Xu held his first solo concert "First Light Asia Tour 2016" at KBS Arena in Seoul on Saturday. All 3,000 tickets were booked immediately when reservation started early this month. The Dong-A Ilbo met him on the eve of the concert at a hotel in Seoul. Many girl fans were present at the hotel lobby hoping to see him. "When I was in Seoul last time, I was walking down the street on Garosugil when a Korean recognized me. Well, the number since then grew to 10, and then to 100. I was perplexed but felt great." Xu had visited Korea in March this year. Though it was a personal trip, fans still flocked to the Incheon International Airport. "I was really surprised to see so many people at the airport, but was more surprised to see the placards that fans prepared this time," he said. "Korean fans have great manner and are enthusiastic. I was really impressed." Having debuted as an actor, Xu Weizhou recently released an album that included songs of his own composition. He is also making an Asia tour concert. "I majored in acting. The advantage of it is that I can show people what I have learned," he said. "Yet, I have long dreamed of becoming a singer. I have had experience of creating a band and performing. Singing is more intuitive and I like it since I can directly share my feelings with fans." He prepared various genre of songs ranging from pop to rock for the concert in Seoul. He also prepared greetings in Korea. He actually pronounced "I love you" and "Hello" quite well. When asked what he likes about Korea's culture, he listed entertainment programs such as "Running Man" and "Kang Ho-dong's Match Made in Heaven." "I like actor Ha Jung-woo. I watched 'Chaser' and liked it very much," Wu said. "I was an ordinary student who was full of dreams. Now that I'm known by a lot of people, I have come to think that life is not something one can predict. While it is not comfortable going out, I'm grateful that many people actually help me out with numerous things when I'm outside," he said. "I want to do my best in both acting and singing. In the process, I want to contribute to spreading Chinese culture among Korean people." In less than six months, an ordinary college student has become a social media star in boasting of 2.4 million followers.